Huntstile organic farm is exactly what is says it is - an organic farm deep in the Somerset countryside. It’s a very beautiful site too, with camping in the orchard and lots of wildlife - not surprising as they are careful not to use pesticides that kill insects and which in turn drives away the birds. They are very keen on recycling too which means you can leave your cans and bottles (and more) at the site. It is quite pricey now (2015) - £15 per night for two people but we think it’s worth it. 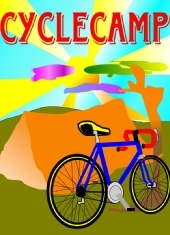 (By the way, we are encouraging all campsites selected for the cyclecamp network to have a special rate for cyclists.) But at Huntstile at least you get a 5% discount as a cycle camper which is great. They also have an eco car-free camping area which we would like to see reserved for cycle campers. 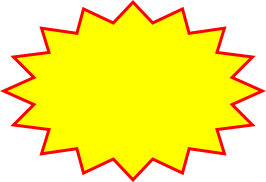 Give them a try and tell us what you think here. Awaiting affiliation: This campsite has been carefully selected for the cyclecamp network but is not yet affiliated to cyclecamp. Based on an organic farm, environmentally aware and mad keen on recycling, Huntstile is one of cyclecamp’s favourite sites. A small pitch is £12.50 (good value for two) and the site has the usual basic facilities. Do book in advance. 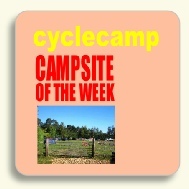 Cyclecamp is hoping that their eco-tent space will be extended to cycle campers. Brilliant!